How did astronauts learn to walk in space? In part, they learned from the animal kingdom's master of the freefall: the common house cat. In the 1960s, Stanford University professor Thomas R. Kane spent two years studying the mechanics of feline falls. His equations were able to predict the overturning of cats as they bent at the waist and moved themselves to side, and eventually down to achieve the four-point landing that lets cats land on their feet. Believing Kane's research could prove valuable to spacewalking astronauts, NASA awarded Kane a $60,000 grant to develop weightless cat-like maneuvers. Kane would film a cat bouncing on a trampoline, study its movements, and then a gymnast in a spacesuit would try to reproduce the cat's movements on the trampoline. Kane was able to develop several maneuvers that allowed his bouncing faux astronaut to twist his body by moving his arms and hips. 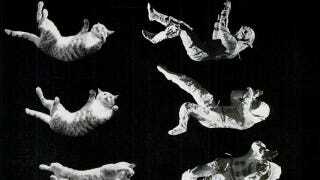 You can see comparisons of cat and astronaut falls below. Kane and his cat-astronaut experiments appeared in Life magazine in 1968.